For the month of September two (2) chinchillas were surrendered and three (3) chinchillas were adopted. Our super secret news is stagnant. Sorry I don’t have more to share just yet. But we do have a new addition! We’ve brought in a livestock guardian puppy to the menagerie. Until we can have her guard the horses, Nova is perfectly content to guard the chinchillas. Which leads me to the following post all about how to introduce (or keep) chinchillas and dogs. People regularly excuse themselves from adopting chinchillas based on the fact that they have dogs, or cats, a mean parrot, etc. We have those as well, but manage to manage the zoo effectively enough. We can share some of our no-nonsense tips with you. 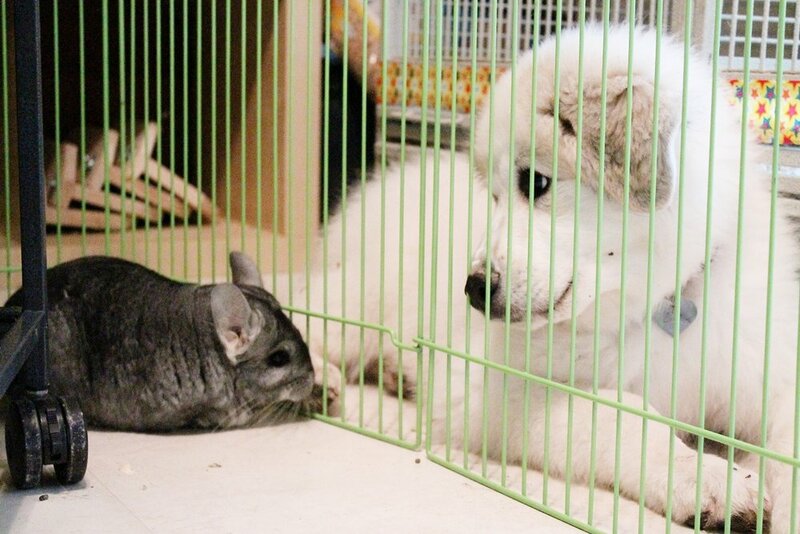 First, be aware that there are certain breeds or species (hunting dogs, ferrets, cats) who are predators of chinchillas. Let’s talk specifically about dogs though, shall we? Dog that were bred as ratters (terriers, dachshunds, pinschers) are typically not chinchilla-friendly dogs. Now, everyone must graduate bottom of the class so there are some varmint killing dogs that don’t do that job well. Those are the oddities you see on YouTube that show predator and prey sharing a food bowl or snuggling together or some other such weirdness. So to be clear, I do NOT advocate intermixing species to let them “play.” But you can train your dog to respect the other furry house pets and not simply consider them house pests. A proper introduction is crucial. Allow the dog and chin to interact on their own terms behind the safety of cage bars or playpen. Do NOT hold a chinchilla up to a dog or other animal to sniff noses. Holding a chinchilla literally traps them in your hands and does not allow them stress relief to turn or run away. Do NOT hold a dog back from a chin. Be sure there is a safe (non-human) barrier between the two while they are learning about each other. Now here’s the training part. Praise the dog like crazy if he or she is behaving well. If the dog is calmly sniffing, that’s perfect! If the dog becomes overeager, lunges at, pokes a nose, swats or barks use your super-special tone of voice to let it know that the behavior is unacceptable. Match your tone to the level of misbehavior. If you limit addressing a dog only when it misbehaves, then the dog may learn to seek interaction with you by “being bad.” One human/dog couple we know lives on the route we regularly ride our horses. When the owner is absent, the dog is a perfectly well behaved individual. She stays in her yard, doesn’t bark and just watches as we ride by. When the owner is present, the dog goes bat$hit crazy. The owner freaks out to the verge of an aneurism and there is a lot of noise an chaos all around. The dog has learned to behave a certain way which elicits a certain response from its owner. But back to dogs and chins. You can use an arm extender (rolled up newspaper, flyswatter, etc.) to swat the GROUND next to the dog if it becomes too excited. Remember to praise calm behavior. Relax. Your dog knows when you’re stressed out. If you leave the chins completely off limits then the dog will obsess over getting to the object of their desire. The key is consistency in showing the dog what is acceptable. Here’s another little side story. In a vet’s office another patron’s dog jumped up on me as I was sitting with a carrier of chins. I firmly put the dog off of my lap and proceeded to pet her as long as she had her feet on the ground. The owner apologized for the dog jumping up on me and stated that she hadn’t learned not to jump up on people yet. The very next thing this woman did was pat her lap to encourage her dog to jump up on her! I then pointed out that she just effectively taught the dog that it is, in fact, ok to jump up on people. Mystery solved. To date we have trained up 6 successive Menagerie dogs of various breeds to respect the chins. This makes it so that if there is ever a cage escape, we don’t fear finding a massacre. If you are lucky (or if you’re not doing your job to protect), you may have a chinchilla who helps in the training department who will defend their personal space with a nip, spray, bark or rush.